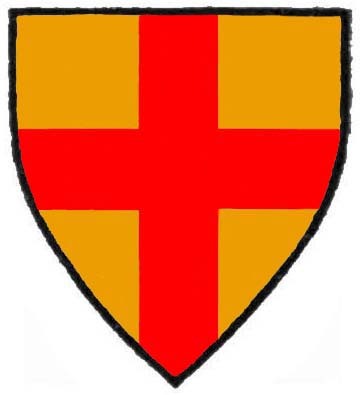 The basic shield, Or a cross Gules, was associated with the mainline of the de Burgh Earls of Ulster and Lords of Connacht, the last of whom was murdered in 1333. 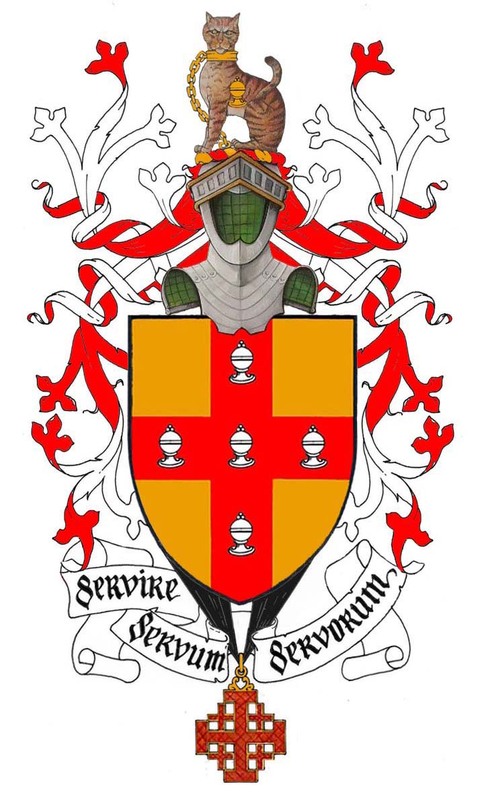 As descendants of Bourke of Shrule or of Castleconnell, the arms historically associated with this family included at least the hand couped at the wrist in either of the upper cantons but they appear to have come to bear the earlier ‘Or a cross Gules’ without a charge based on their use of the surname Burgh and later de Burgh rather than on a descent from the mainline of the Earls of Ulster. One of the earliest examples of a change in field to differentiate between senior branches of the name is that of the Viscounts Bourke of Mayo. Theobald 1st Viscount Bourke of Mayo died in 1629 and his funeral entry in the office of the Ulster King of Arms displayed his arms, beneath a coronet of rank, as ‘Per fess Or and Ermine, a cross Gules, in the dexter canton a lion rampant Sable and in the sinister a hand couped at the wrist Sable’ and impaled with those of his wife’s family of O Connor Sligo. 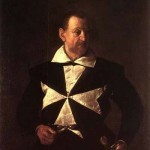 [iii] (His funeral entry did not display a crest or supporters. )[iv] His immediate descendants bore the same shield divided ‘per fess Or and Ermine’ about the cross. Shield, helmet, crest and supporters of Dermot Robert Wyndham Bourke, 7th Earl of Mayo and Viscount Mayo, born in 1851, after Joseph Foster’s ‘Peerage of the British Empire for 1882,’ showing the shield divided per fess Or and Ermine. Another family whose arms also involved a variation to the field was that of the Burkes of Marble Hill in County Galway. The lion rampant was used in the upper dexter canton as the sole charge by the senior-most member of this family, although there is no definitive evidence of direct descent from the Earls of Clanricarde. (This would not preclude their possible descent from an early chieftain of the Burkes of Clanricarde, but again there is no definitive proof to this effect.) 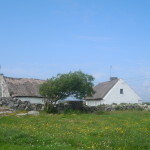 This family emerged from the position of minor landholders in the south east of County Galway in the early seventeenth century to become significant landowners in that region and baronets of Ireland in the eighteenth. 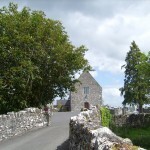 [vi] This branch came to bear ‘Erminois, a cross Gules in the upper dexter canton a lion rampant Sable.’ Their principal seat in the parish of Ballynakill in South East Galway was burned in the early twentieth century in the Irish Civil War and the estate was eventually sold and the family removed to England where the line of the baronetcy continued. 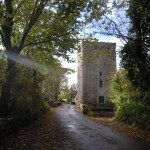 The Burkes of Elm Hall, near the villages of Carrig and Riverstown, County Tipperary, were a junior line descended from Dominick of Clondegoffe’s second son Peter of Parsonstown (ie. 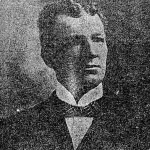 Birr) in King’s County, who married a daughter of Henry Comerford of Faddanbegg (near the village of Carrig and town of Birr). Dying in 1764, he was ancestor of the Burkes of Rockville and Clongowna and Elm Hall, all in north County Tipperary and all in close proximity to Parsonstown, Kings County (ie. modern town of Birr, County Offaly) in which churchyard members of succeeding generations of this family were buried. Peter Joseph’s father, John, settled in London in 1811 and was the author a number of genealogical and heraldic works such as ‘Burkes Peerage and Baronetage’ and ‘The Commoners.’ A number of his immediate descendants pursued a similar path and went on to found a family intimately connected with heraldry in Great Britain and Ireland. Peter Joseph died unmarried in London in 1881. His next eldest brother, John Bernard Burke, called to the bar in 1839, was author of numerous genealogical works, including ‘Burke’s Peerage and Baronetage,’ ‘Commoners,’ ‘Landed Gentry’ and others. Knighted in 1854, he went on to become Ulster King of Arms and Registrar and Knight Attendant of the Order of St. Patrick, Keeper of the State Papers of Ireland and Governor and Trustee of the National Gallery of Ireland. [ix] As a beneficiary of the confirmation of arms to his elder brother and the other descendants of their common grandfather, he and his descendants likewise bore the same two lions Sable upon their shield and the same crest. Sir John Bernard Burke, in associating his ancestors of Clondegoffe Castle with descent from the Burkes of Meelick, in at least one reference gave their late sixteenth century ancestor as John Burke, Baron of Leitrim, son of Richard, 2nd Earl of Clanricarde. This John, Baron of Leitrim was described by Sir John Bernard Burke as ‘of Meelick’ but this would appear to be an incorrect attribution, as there is no evidence that John ever resided there and only jointly with his father held a lease of Meelick castle and manor from the Queen from December 1570 to Michaelmas 1576 prior to their forfeiture of the same for failure to pay rent during that period. [xi] (In 1577 Meelick was then leased to one John Vawse, gent. )[xii] The family pedigree appears to have erroneously equated this Meelick Castle in the east of County Galway (in the modern parish of Meelick, barony of Longford) with another Meelick which, although now in County Clare, once lay within the barony of Leitrim in south east County Galway prior to nineteenth century country boundary alterations. This, however, does not preclude the descent of the family of Elm Hall from the Clanricardes, who held Clondegoffe Castle for a considerable period of its history, but it appears unlikely that this John Burke, Baron of Leitrim, murdered in 1583, ever resided at either Meelick. The arms of Ulick John Burke, Esquire, Bachelor of Arts of the University of Oxford, J.P. for the Counties of Essex and Southampton, sometime Captain, Suffolk Yeomanry Cavalry, Barrister-at-Law, born in 1843, fourth son of James St. George Burke, Esq., Q.C., of Auberies, Sudbury in the County of Suffolk, after those illustrated in Fox-Davies’ ‘Directory of Gentlemen of Coat-Armour, 1905. No mark of cadency was given indicating his position among the sons of his father. 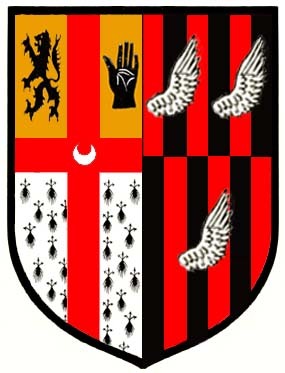 Another example of arms granted to an individual believed to be descended from a de Burgh or Burke ancestor, although no longer bearing that name, is that of the arms granted in 1954 to the Most Reverend William J. Philbin, Roman Catholic Bishop of Clonfert by the Chief Herald of Ireland. In this case again a variation employing charges in various cantons on either side of the cross Gules was used. These arms consisted of a shield ‘Or on a cross Gules between in the first quarter a lion rampant and in the fourth quarter a dexter hand couped at the wrist Sable, an antique scroll with seven broken seals Proper.’[xvii] During his time as Bishop of Clonfert he used these arms impaled with those of the Diocese of Clonfert, with the latter on the dexter side of the shield. 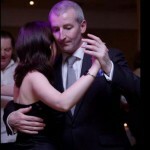 Two distinct families of the name Philbin arose from northern Connacht, from the region later defined as County Mayo. While one emanated from the baronies of Erris and Tirawley as a branch of the wider Barrett family, another, as the Clan Philpin, a branch of the wider de Burgh or Burke family, are reputed to derive their decent from one John, son of Philip, a younger son of that William óg de Burgh killed at Athanchip in 1270, son of Richard, first de Burgh Lord of Connacht. The latter, as a Gaelicised sept were established in the baronies of Burrishoole and Carra in the late medieval period, the head of which was known as the MacPhilibin. Their common descent with others of the name Burke was not forgotten and when John MacOliver Burke, the chieftain of the Mayo Burkes or MacWilliam Iochtar came before Sir Henry Sidney in 1576, Sidney noted that he brought with him all his brethren, together with ‘MacPhillippin, who in surname is a Bourke, as he is.’[xix] In granting Bishop Philbin arms composed of a variation of those used in the late sixteenth century by the MacWilliam Iochtar, chieftain of the Mayo Bourkes, the Chief Herald of Ireland associated the Bishop with the latter family of Philbin. The vast majority of grants and confirmations of arms made by the Ulster King of Arms and Chief Herald of Ireland to armigers of the name Burke involved the placing of charges in one or more of the cantons about the cross Gules rather than on the cross. An early example of differencing between branches bearing ‘Or a cross Gules’ by the placing of charges upon the cross occurred in the Bigod family, with the mainline Earls of Norfolk bearing the simple uncharged cross and Ralph of Settrington in Yorkshire bearing ‘Or on a cross Gules five escallops Argent.’ The same arms of five escallops were ascribed to Sir Raffe Bigod of Norfolk and one John Bigod in the medieval period. Arms of Donal Gerard Burke, Knight Commander of the Equestrian Order of the Holy Sepulchre of Jerusalem, eldest son of Daniel Burke of Killaltanagh, parish of Clonfert, County Galway, after those granted by the Chief Herald of Ireland, N.L.I., Dublin, G.O., Ms. 111, Vol. Aa, Fol. 37. 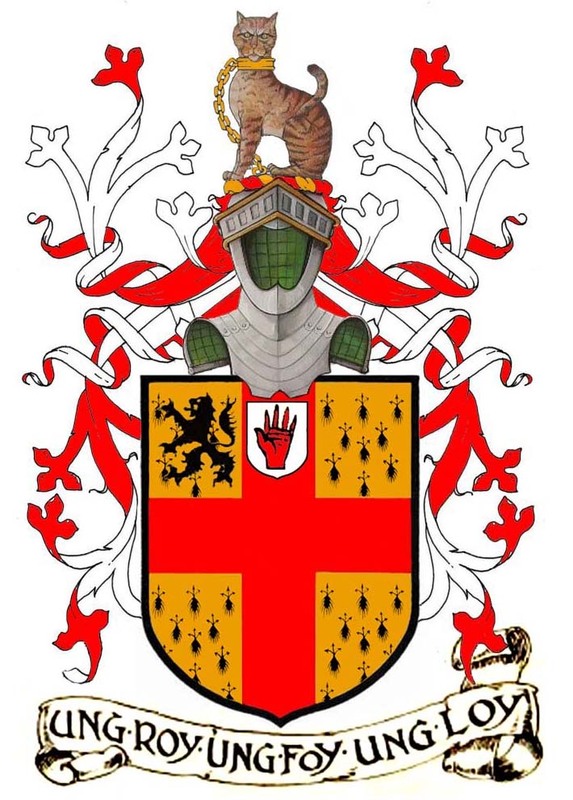 Arms granted by Ulster King of Arms on 30th April 1902 to Edmund Francis Bourke of Pretoria, Transvaal Colony, Gentleman, eldest son of John Bourke, third son of Patrick Bourke of Kanturk, County Mayo, Esquire, eldest son of Patrick Bourke of Kanturk, County Mayo. 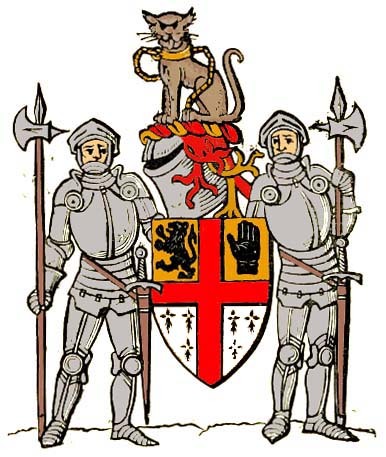 The arms were granted to Edmund Francis Bourke, his descendants and the other descendants of his father John Bourke, ‘with their due and proper differences according to the Law of Arms.’ N.L.I., Dublin, G.O. Ms. 111, Grants and Confirmations of Arms, Vol. J, 1898-1909, Fol. 117. The addition of a border or ‘bordure’ about the shield is noteworthy as a rare means of differentiation in Burke arms. One of these few armigers, however, recorded with arms bearing a bordure was Henry Burke of Clough, gentleman, third son of Sir Hubert Burke of Glinsk, who died in November 1635 and was buried in St. James’ Churchyard, Dublin. 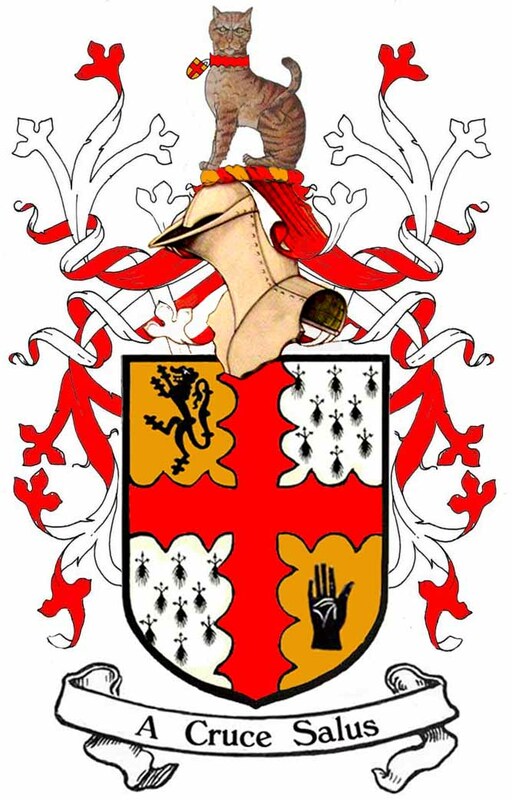 Married to Mary, daughter of Thomas Burke of Tubirry, County Galway, by whom he had five sons and five daughters, his funeral entry in the records of the Ulster King of Arms shows his arms impaled with those of his wife’s family. On the dexter half of the shield his own arms are shown as ‘Or a cross Gules in the dexter canton a lion rampant Sable surrounded by a bordure Sable’ and at honour-point a mullet to indicate his position as the third son. [xxii] On the sinister half his wife’s family arms are shown simply as ‘Or a cross Gules in the dexter canton a lion rampant Sable. 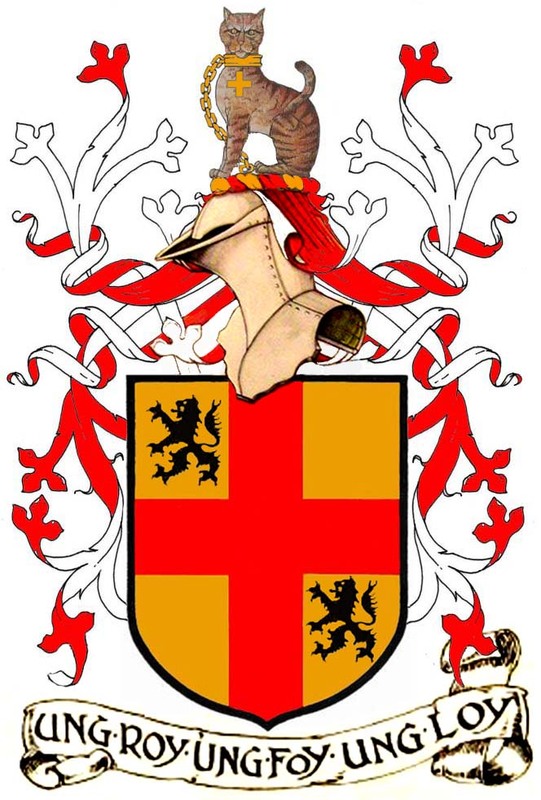 His arms are noteworthy in that the greater majority of armigers of the family of Glinsk did not carry a bordure upon their shield and are commonly attributed a crest of feather emanating from a ‘coronet’ while Henry of Clough’s crest was described in his funeral entry as ‘Clanricard’s crest without chain or collar’, implying a cat a mountain. No motto or illustration of the crest was given in the funeral entry. The impaled arms of Henry Burke of Clough, County Galway, gentleman, who died in 1635, third son of Sir Hubert Burke of Glinsk, County Galway, as given in his Funeral Entry, showing the bordure Sable on the dexter side of the shield. The crest of a cat a mountain Proper without collar or chain was described in that Funeral Entry but not illustrated. [i] Burke, B., A genealogical history of the dormant, abeyant, forfeited and extinct peerages of the British Empire, London, Harrison, 1866, p.91; N.L.I. Dublin, G.O. Ms. 170, Registered Pedigrees Vol. 16, c. 1816-1817, pp. 1-4. This family pedigree, certified by Ulysses Burgh of Bert in 1818, displayed the arms as Or a cross Gules with a crest of a cat a mountain sejant Proper and a motto of ‘Un Roy Une Foy Une Loy.’ The exemplification was amended in pencil to show the cat chained and the motto amended to read ‘a cruce salus.’ The same family pedigree did not show a clear line between Rt. Rev. Ulysses Burgh D.D., Lord Bishop of Ardagh and the preceding generation, giving as his possible father one Edmond Burgh of Dromkeen. This pedigree also gave the Bishop’s eldest son as Captain William Burgh of Bert, his second as Thomas of Oldtown and third son as Reverend Richard Burgh of Dromkeen, who died between 1735 and 1739. William Betham Ulster King of Arms in another pedigree of the wider family amended the earlier pedigree and gave as father of Rt. Rev. Ulysses Burgh, Lord Bishop of Ardagh who died in 1692 one Rev. Ulysses Burgh of Dromkeen, ‘Minister of the Gospel’ in 1656, son of Ulick or Ulysses Burgh of Dromkeen, second son of Richard Bourke of Dromkeen, descended but not in a clearly recorded line from Meyler son of William duff of Dromkeen.(N.L.I. Dublin, G.O. Ms. 169, Registered Pedigrees Vol. 15, c. 1813-1839, pp. 187-191.) This last pedigree gave Rev. Richard Burgh of Dromkeen, Chantor of Emly, who died between 1735 and 1739 as the elder brother of both Captain William Burgh of Bert and Thomas Burgh of Oldtown, M.P., Engineer and Surveyor General. [ii] Burke, B., Genealogical and heraldic dictionary of the peerage and baronetage of the British Empire, London, Harrison, 1865, p. 351. [iii] Lodge, J., Archdall, M., The Peerage of Ireland, or, a genealogical history of the present nobility of that kingdom, with engravings of their paternal coats of arms, James Moore, Dublin, 1789, Vol. IV, p.236. [iv] N.L.I. Dublin, G.O. Ms. 68 Funeral Entries, p. 147. The children of the first viscount were given in his funeral entry as Rt. Hon. Miles Viscount Bourke, David, Theobald, Richard, Mary, Onora and Margaret. He was buried at Ballintubber, County Mayo. [v] N.L.I. Dublin, G.O. Ms. 68 Funeral Entries, p. 154; G.O. Ms. 79 Funeral Entries, p. 159. 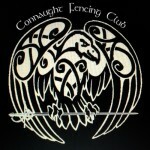 His impaled arms in the second Entry omit the crescent. 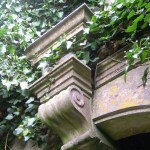 [vi] Sir William Burke Teeling, writing in 1932, referred to the Burkes of Marble Hill as ‘only descended from a Burke peasant.’ (http://indigo.ie/~wildgees/burkes.htm) This view was thereafter repeated by others and is erroneous. 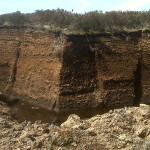 The earliest recorded early seventeenth century ancestors of this branch in a definite continuous line of descent were listed as landed proprietors in the Patent Rolls of the reign of King James I and in the mid seventeenth century Books of Survey and Distribution. Given the system of land ownership and inheritance at that period, these individuals would have been at least obscure junior members of middle rank, descended from earlier ancestors of social and economic significance. [vii] Burke, Ashworth P., Family Records, VI, London, Harrison and sons, 1897, p. 122-6. [viii] Burke, Ashworth P., Family Records, VI, London, Harrison and sons, 1897, p. 122-6. This same shield with a cat a mountain crest was illustrated among the arms of numerous armigerous families associated with the town and county of Galway on a mid to late seventeenth century pictorial map of the town of Galway. The border of this map, however, upon which the arms appear, is believed to date from a later period and the specific arms with the lions rampant in the top dexter and lower sinister quarters are unattributed to their owner on that map. [ix] Burke, Ashworth P., Family Records, VI, London, Harrison and sons, 1897, p. 122-6. [x] Burke, Ashworth P., Family Records, VI, London, Harrison and sons, 1897, p. 122-6. [xi] Griffith, M.C., Calendar of Inquisitions formerly in the office of the Chief Remembrancer of the Exchequer prepared from the mss. of the Irish Record Commission, Co. Dublin, Dublin, I.M.C., 1991, p. 238. [xii] Griffith, M.C., Calendar of Inquisitions formerly in the office of the Chief Remembrancer of the Exchequer prepared from the mss. of the Irish Record Commission, Co. Dublin, Dublin, I.M.C., 1991,, Dublin, I.M.C., 1991, p. 261. [xiv] Burke, Ashworth P., Family Records, VI, London, Harrison and sons, 1897, p. 122-6. [xv] Fairbairn’s Book of Crests of the Families of Great Britain and Ireland, pp. 87-8. [xvi] Fox-Davies, A.C., Armorial Families, p. 1288. [xvii] N.L.I., Dublin, G.O., Ms. 111H, fol. 22. [xviii] Kelly, Rev. D., Meadow of the miracles, a history of the diocese of Clonfert, Editions du Signe, Strasbourg, France, 2006, p.79-80. [xxi] N.L.I., Dublin, G.O., Ms. 111, Vol. Aa; Fol: 37. The word ‘guardant’ was added in a later hand to the blazon in the official Register of Arms by the Chief Herald in 2016 to give further clarity to the attitude of the catamountain as intended and exemplified in the grant. [xxii] N.L.I., Dublin, G.O., Ms. 69 Funeral Entries, p. 336; G.O., Ms. 79, Funeral Entries, p. 200. His funeral Entry details were given to Albone Leverett, Athlone Pursuivant by his second son Edmund Burke. Henry of Clough’s five sons were given as; ‘Thomas Bourk, son and heir and married to Oner, daughter of Edmund Bourk of Kilcornane in the aforesaid county, Edmund, John, David and Rowland.